ranging from small tailgate smokers all the way up to large catering units built on gooseneck trailers. Regardless of the size of the smoker, you will find that they are all built along the same Reverse Flow concept. This process creates a consistent cooking temperature across the entire cooking surface of the smoker. Normal smokers will have hot spots and uneven cooking which results in poorly cooked products. All of our smokers are tested and seasoned before they leave the shop and are guaranteed to perform at competition level cooking. Along with our basic lineup of smokers within this site, we also build custom units to order and offer shipping options upon request. 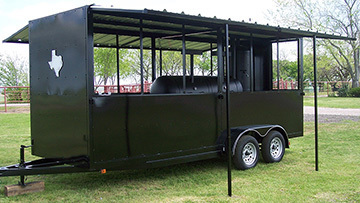 So regardless if you’re in the market for a patio smoker or large catering or competition trailer, Johnson smokers will provide you with a high quality product at a competitive price. All of the smokers built at Johnson Fabrication are built from the ground up with quality materials and are tested and built to competition cooking standards. 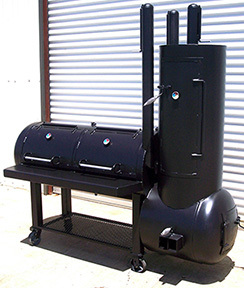 Our smokers are built using steel thicknesses up to ½” thick in certain situations. The fireboxes have spring-handle vents and sealed doors for efficient heat transfer into the main cooking chamber. The main chamber doors have heat-resistant handles, counter-weighted doors, and are also sealed for minimal heat loss. As stated above all of our units utilize the Reverse Flow concept and have dual stacks for trouble-free heat control. The Reverse Flow concept basically involves a removable, adjustable tube that directs the heat from the firebox to the opposite end of the main chamber. At that time, the heat is then allowed to come in contact with the cooking racks and travel back towards the stacks which are set at grate level inside the smoker for added efficiency. This process is the most user-friendly of all the heat transfer processes as it will cook at the same temperature across all the cooking racks. And, once the smoker is setup, it needs no adjustments. In our opinion, the tube has a better seal, when compared to plates that other manufactures use. We have used several Reverse flow engineering variations and have found that our current design yields the best results and is the easiest design for cleaning and removal. After the build is complete, the smoker is tested, seasoned, and triple coated with 1200 degree high heat paint. Johnson smokers have options such as vertical smokers that are also engineered to be used as a warmer if needed as well as independent charcoal grills. With the added options one smoker can cook brisket, charcoal steaks, and smoke links all at different temperatures and at the same time! All of our options are available for any model you choose. 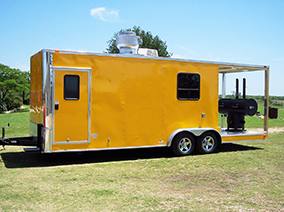 We are also proud to offer the only real tailgate mounted smoker for camping trips, football parties, as well as small catering events. This flagship unit is built on a unique T-design which utilizes a form of reverse flow also. 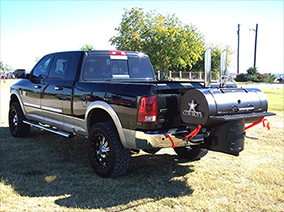 With this unit you get the ability to smoke and charcoal on a unit that can be taken with you on trips without the hassle of pulling a trailer. We are proud to be the only manufacture of this design. Finally, if you have a logo, name, or initials that you would like to be mounted on your smoker, give us a call and we’ll make it happen, free of charge. Johnson Fabrication was founded by Chadwick Johnson in 2003. The business started out and continues to build a full lineup of backyard, competition, and catering style BBQ smokers and grills for people all over the country as well as the world. Upon the creation of the BBQ smoker business, Chad quickly developed the concept of coupling this business with his preexisting metal art fabrication. The Custom Metal Art division handles a wide range of products including Furniture, Entrance Gates, Fireplace Screens, Signs, Clocks, and limitless amounts of wall hanging metal arts just to name a few.